Following this week’s winter weather, as well as cancellations to training and last weekend’s matches, further disruptions are taking place this week to planned hockey sessions. 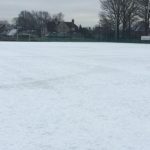 This page will be updated during the week as further calls are made about the suitability of the pitch, the conditions and the welfare of club members. Wednesday night’s Junior Academy training session is not taking place on the 23rd of January. As the pitch is already frozen over and conditions aren’t expected to improve by much, all Thursday night training is off this week. This Saturday’s Development game, at home against Wakefield, has been cancelled as the opposition are unable to raise a side. We'll let you know whenever weather stops play, training or if changes to usual sessions are planned.